Steph Curry is at it again, right in time for Kevin Durant’s looming return and the Warriors’ forthcoming playoff run. 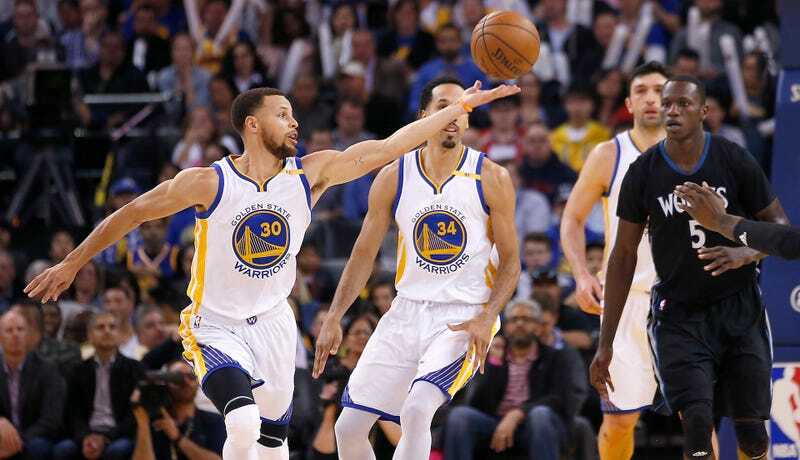 In just over a minute, the Warriors scored 11 points, all of which were either scored or assisted by Curry. He nailed a pair of threes, assisted Klay Thompson for another three, then found Andre Iguodala with, uh, whatever this was at the end here. That little fake-turnaround-to-behind-the-back-pass move may well have been a double-dribble (Mike Breen didn’t think so), but either way I don’t really care. This all came shortly after Steph stole it and notched his third dunk of the season. I think he’s ready for the playoffs.